Do you live, eat, and breathe your vision? Have a great idea for a business, but you’re not sure how to get your startup off the ground? We are proud to support current students and alumni in their journey of becoming entrepreneurs! 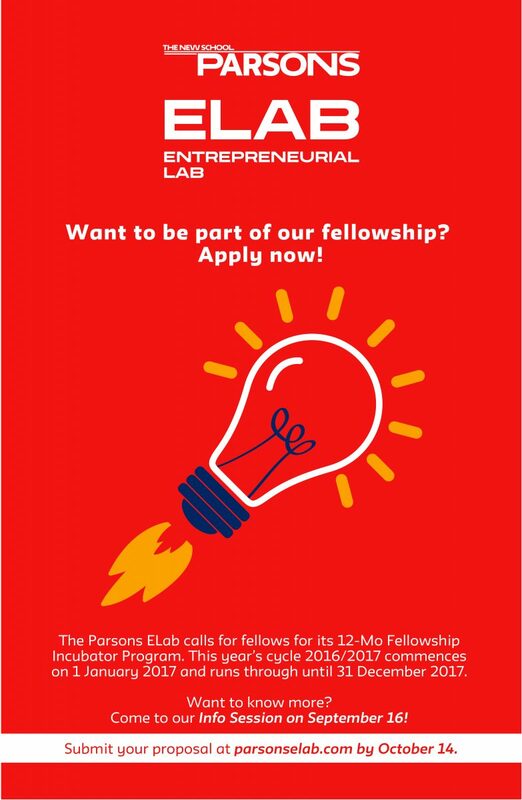 The application for ELab’s 12 Month Fellowship Incubator Program is now open. This year’s cycle 2016/2017 commences on 1 January 2017 and runs through until 31 December 2017. Deadline for applications is October 14. > Complete this form by clicking here. :: Please be advised that finalists will be required for an in person interview. Please, see more details about the 12 Month Fellowship Incubator Program in our website. If you need support to develop your Pitch Deck, in partnership with The New Challenge, ELab will be hosting aPreparatory Workshop on October 1st. Please, RSVP here > seats are limited! !